In the middle of the painting, the temple of Bacchus and the six columns of Jupiter stand still with promptness and a striking accuracy in the stones, columns, capitals, shadows and motifs. A local and harmonious color showered in a soft cozy light affirms the suavity of this work. Serbai’s preciseness does not stop at the temples but rather extends to their exterior and the people there. In the foreground lies an earthy roof of an ancient Lebanese home in front of which, on a path strewn with large stones, a “guide” in local outfit carries out a discussion with another tourist in colonial white, while both are watched by a native from a certain distance. These men serve to remind us of the exorbitant dimensions of such splendid monuments. In the background, the mountains of Lebanon stretch out beneath a serene clear sky. 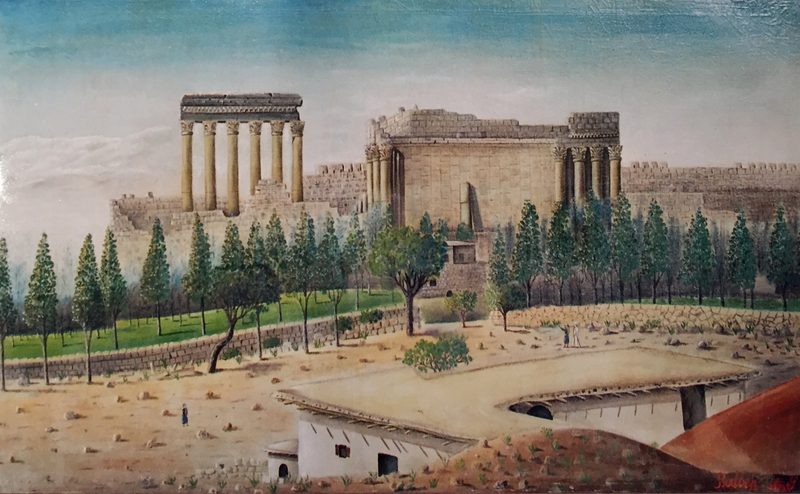 Although he was largely influenced by Orientalists who also painted Baalbek, Serbai surpassed them with his sense of realism, the neatness and delicacy in his painting and above all the transparency in his perception. Hence, it is positively inferred that Serbai is the gifted son of a purely oriental school rather than a school influenced by orientalism. The message he conveys is evident. Baalbek is imperious, magnificent and majestic. Baalbek is eternal. 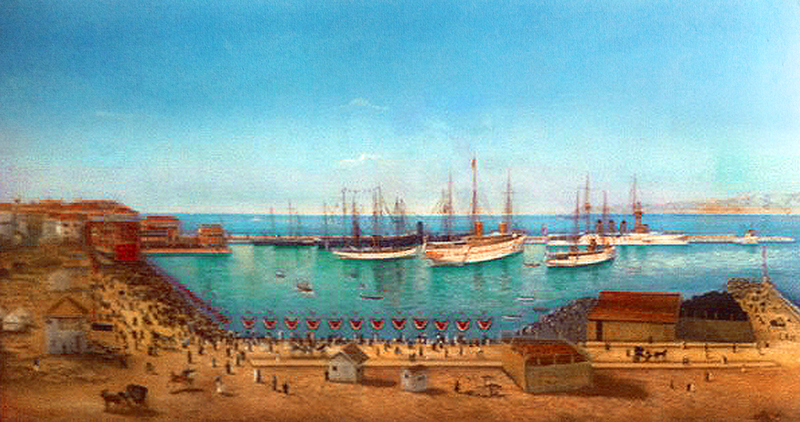 The four copies required of Serbai and drawn by him to illustrate the reception of Emperor Wilhelm II at Beirut port, indisputably point to the significance and beauty of such a ceremonial festive painting (4 oil paintings of dimensions 135 x 70 cm). 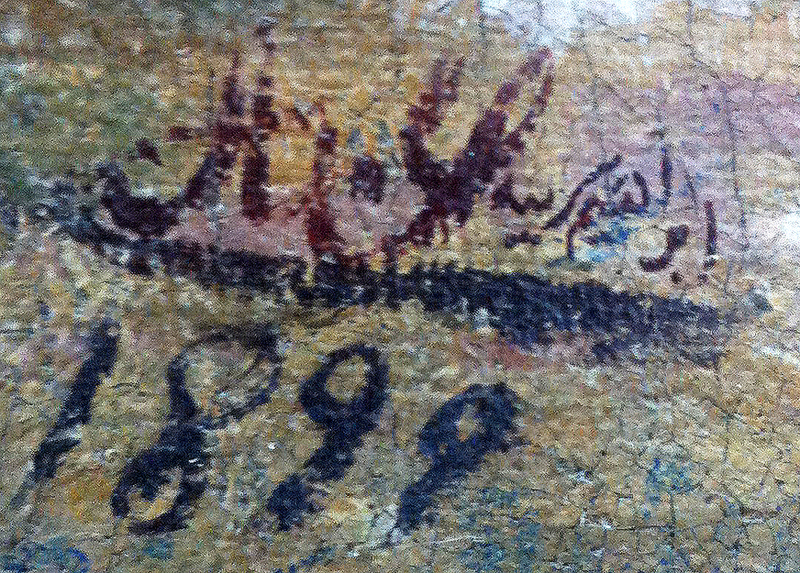 However, the minimal differences which exist between the copies regarding representation, dimensions and signature position won’t be mentioned for they don’t affect the paintings’ charm in any manner. A refined and scrupulous detail appears everywhere in the painting, starting at the extreme left from buildings in Bab Idriss, Zeitouni and Ain El Mreisseh quarters and reaching to the crowd elegantly dressed up with pageantry costumes as they stroll on the sidewalks amidst horse-drawn vehicles which wait for customers. 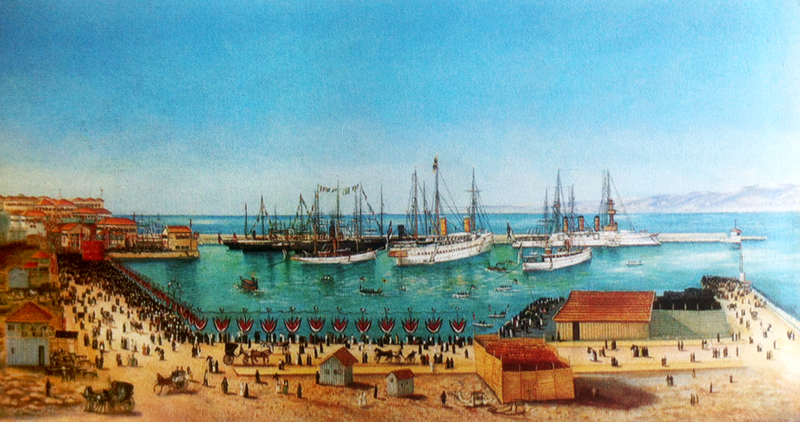 The details further extend to the cyclists, the Turkish and Prussian flags decorating the streets, buildings and official centers, as well as the imperial yacht berthed along with escorting ships in front of the pier (the current first basin). Even in the water’s reflections and the mountains resting under an immaculately blue sky, Serbai’s attention to detail is undeniable. Just like in other paintings by Serbai, the light in this one is hierarchical and serene echoing a carnival of real and harmonious colors. It is a striking and pompous painting which triggers your dreams in a concrete ambience, for an ultimately important occasion of receiving “Kaiser” in Beirut. 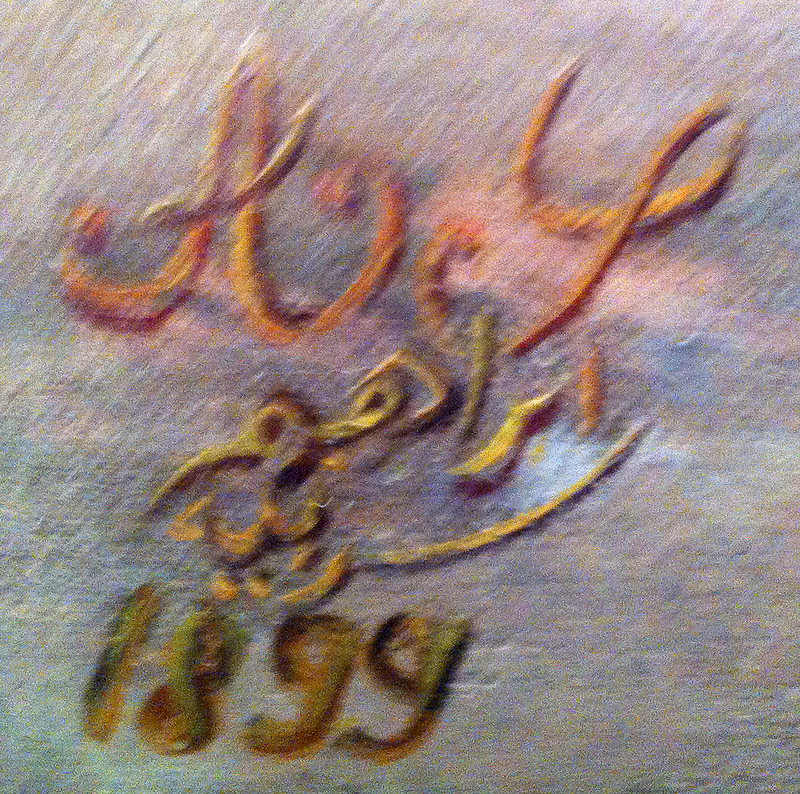 It is a painting full of vigor and emotion communicating to us a particular joy of living in Beirut at the end of the 19th century. This representation of the seafront view in Ras Beirut is a thoroughly detailed work by Serbai. 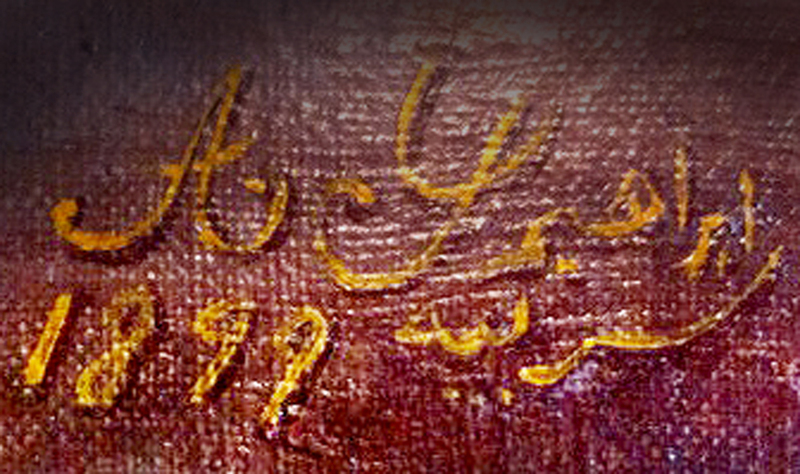 Although not signed, its authenticity to the artist’s identity is undoubtable. 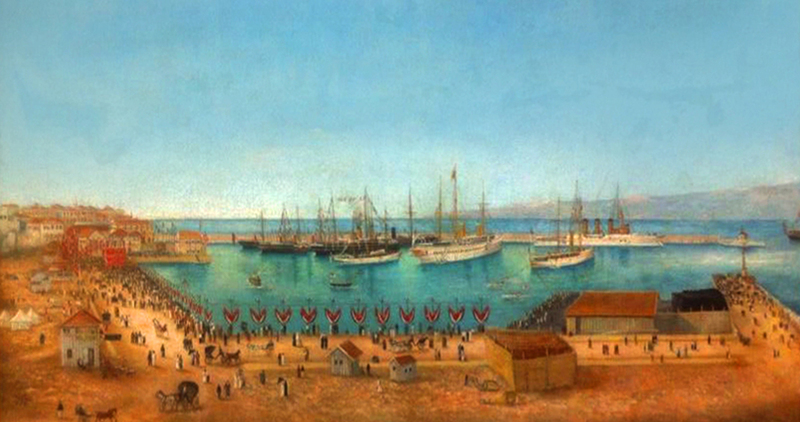 It is a masterpiece (oil painting of dimensions 200 x 70 cm) of the late 19th century, portraying the scenery of Ras Beirut from a maritime rock. Houses, hotels, coffee shops and schools are all there in tight compliance with their arcades, balconies, ogives, windows, doors and bricks. The painting was inspired by a photograph shot by “Bonfils,” but Serbai’s approach to it reflects sensitivity and remarkable mastery only a great painter can possess. Here, Serbai draws his soul, his sky, his sea, the city where he was born, the houses where he was raised and by which he passed thousands of times, the shores where he contemplated the sea for hours and dared to dream. He faultlessly knew the smallest nooks of his city, more than all photographs have ever captured. Beirut is expressive and impressive, beautiful, unique yet true to itself. 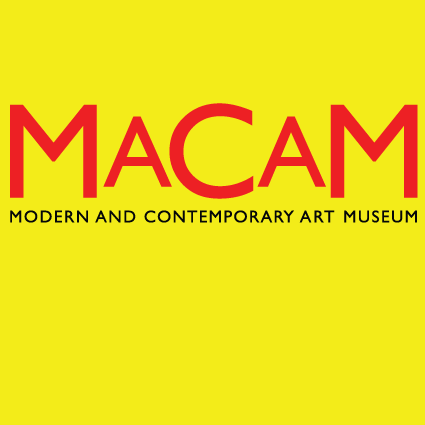 Its colors are familiar to those of everyday colors and not overly bright. Its sky is clear. Its sea is calm and welcoming. Beirut is captivating and subtle but certainly oriental.